Good day today!! Jay got his chest tube and epidural out earlier in the day and we’re making steady progress towards getting discharged from the hospital sometime tomorrow. 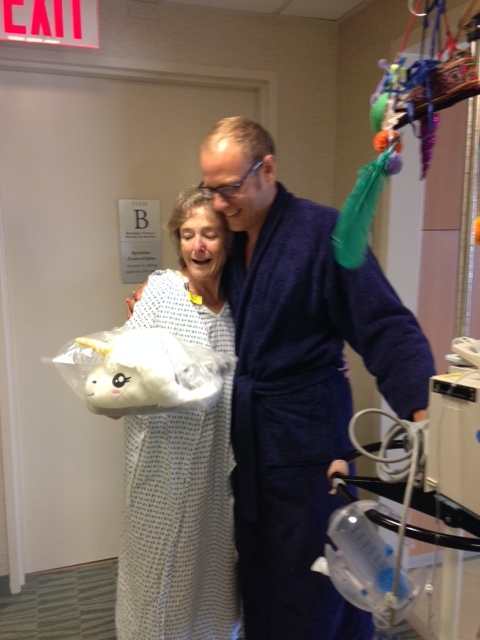 Also, he did a full two miles of laps around the floor, basking in the steady stream of praise for his signature unicorn slippers (gift from his Bootsoft crew). One fellow patient was coveting his slippers so much that he went online and had a pair shipped directly to the hospital. The power of the unicorn is strong on the 18th floor! There were so many nice visits too, both yesterday and today. We won’t be sad to leave the hospital, but it is such a wonderful thing to see so many people and be reminded of how enduring your love and support has been this past year. You guys are our umbrella. We love you! Jay, I am so happy for you and Katie Rose. Let the healing continue!! Thanks for sharing KR! Such joy and happiness! Love to you both. Pure love, Pure Jay. I’m so glad you’re coming home quickly this time! Thank you Katie Rose for sharing. You are a champ. And that “Ella, Ella, Ella” is so dear to me, that was going to be Erik’s name if he had been a girl. Rock on, brother. Rock on. I’ll jam with you any time. Such a great post! And I love the unicorn slippers! Love you both! LOVE this. Thank you so much for sharing Katie Rose. Does my heart good to watch. Sending love. Beautiful! Thanks so much for posting this. Wonderful to hear that Jay will be discharged tomorrow. Sending love!